South Korea plans to turn the nation’s robotics technology into a 15 trillion-won ($13.3 billion) industry, with the aim of becoming the fourth-largest player in the world by 2023. 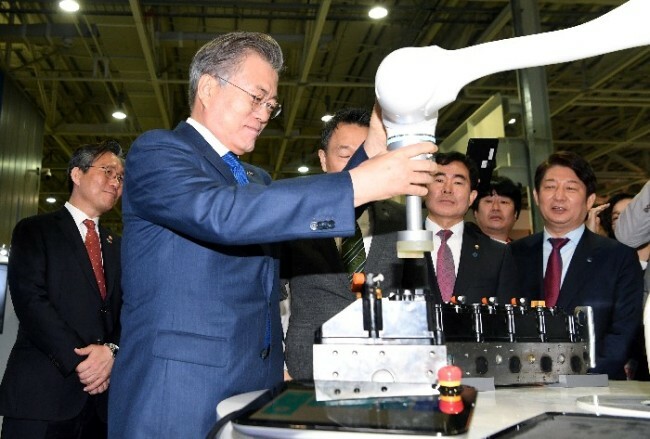 “Traditional manufacturing sectors can be transformed into future industries by making use of robots,” said President Moon Jae-in at a briefing session on the nation’s robot development strategy at the headquarters of Hyundai Robotics in Daegu, Friday. “The government has set a goal of turning the nation’s robotics industry into the fourth-largest player in the world by 2023 with the aim of fostering 20 major robotics companies,” Moon said. The 20 companies refer to firms each generating 100 billion won in sales. The Ministry of Trade, Industry and Energy announced on the same day it would finance the distribution of 7,560 manufacturing robots to replace human workforces in the areas of textiles, foods and beverages that have been losing workers due to hostile work environments and work intensity. As for the service robots, whose development is still in its infancy in Korea, the government plans to inject 300 billion won of research and development funds starting next year. The funds will help foster robots to cater to growing need in areas of caring, clothing and logistics. To create a healthy ecosystem for robot businesses, the government also plans to nurture robot integrators that analyze clients’ needs and provide solutions for automation. The plan will also focus on breaking free of the local industry’s reliance on the US and Japan for key parts and software of robots, the ministry said. “New technologies like artificial intelligence and the fifth-generation network are being integrated with robots and they are expected to be used for our daily lives as well as for manufacturing sectors,” said Industry Minister Sung Yun-mo. “Through the plan, the government will help boost the robotics industry in both manufacturing and service sectors,” he added.